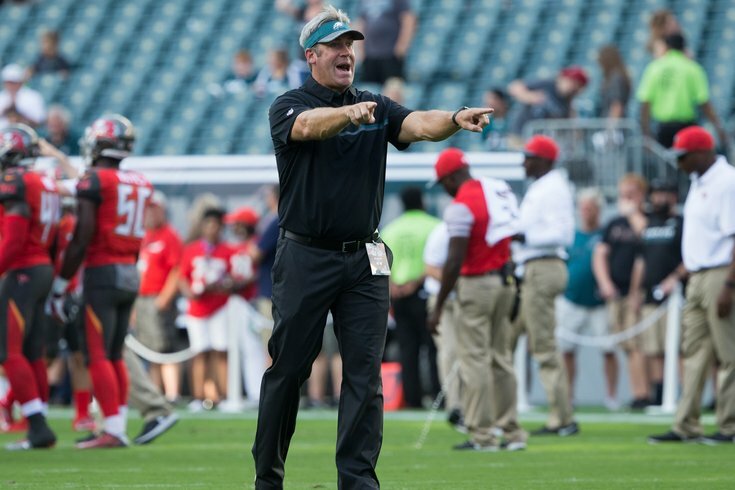 Doug Pederson is excited that I'm picking the Eagles again. For the gambling degenerates, here are my Week 2 NFL picks. To note, the team logos indicate who I think will win the game, not cover the spread. At the end of the picks, I'll note a few teams that I like based on the spread. Please open up an extra browser with this music playing as you read this. Thanks. Ravens at Bengals (-1): The Bengals beat an awful Colts team, so they'll be overrated to some degree, and I imagine the line is Cincy -1 because they're home on a Thursday night. Meh. I'll take the Ravens, who didn't face much resistance at all from the Bills Week 1, and will still be fresh on a short week this early in the season. Baltimore is incredibly boring to watch, but they're better than perceived. Panthers at Falcons (-6): The Panthers and Falcons have both suffered major injuries. The Falcons put Deion Jones and Keanu Neal on IR, while the Panthers have lost both of their starting offensive tackles, as well as Greg Olsen. The positional importance of protecting the edges is far higher than a linebacker (albeit a great one) and a safety. Carolina is in big trouble. Colts at Redskins (-5.5): I'm going to sound like a broken record here, but the Redskins are better than people think, as they have fewer holes on their roster than most teams in the loaded NFC. Meanwhile, there aren't many positional groups on the Colts' roster that aren't gaping holes. I'll lay 5.5 points in this matchup all day. Texans (-1.5) at Titans: The Titans have a banged up offensive line and quarterback, and just aren't very good to begin with, despite making the playoffs (and actually winning a playoff game) last year. The Texans showed something in the second half against the Pats, and can carry that forward into Week 2. Eagles (-3) at Buccaneers: The Bucs could be missing both of their starting corners, as Vernon Hargreaves was placed on IR, and Brent Grimes still hasn't practiced as a result of a groin injury. They could also be without Eagle-killing WR DeSean Jackson (concussion), DE Jason Pierre-Paul (knee), and DT Vita Vea (calf), all of whom did not practice on Wednesday. The Eagles, meanwhile, will be getting an important player back in Nigel Bradham. It's projected to be 91 degrees and humid in Tampa on Sunday. You'd think that would work in the Bucs' favor, since they play there, but it won't. The Eagles have the deepest defensive line in the NFL, and have the advantage of rotating their personnel. You know, throwing fastballs, and whatnot. The Eagles should be well-positioned to take control of this matchup in the second half when fatigue sets in. Also, the Eagles are just a far better team, so there's that. Chiefs at Steelers (-4): The Steelers were staring down the barrel of a loss to the Browns in a game in which they lost the turnover battle 5-0, but they were fortunate enough to get a blocked field goal attempt in overtime to preserve a tie. In each of the last two years, the Steelers beat the Chiefs after bad performances. In 2016, they looked awful in a 31-3 loss to the Eagles, and they hammered the Chiefs 43-14 the following week. In 2017, the Jaguars smoked the Steelers 30-9, and they rebounded to beat the then-undefeated Chiefs 19-13 in a game that wasn't as close as the score would indicate. Anyway, the moral of the story here is that the Steelers are prone to a few very bad games each year, but they usually regroup the next week. Factor in that the Chiefs played in LA Week 1, and have to go right back on the road Week 2 to Pittsburgh, and Andy has his work cut out for him. Dolphins at Jets (-3): I'll stay away from this matchup of surprise 1-0 teams until I figure out what they are. For now, I'll take the home team, I guess. Chargers (-7.5) at Bills: The Bills looked like the worst team in the NFL Week 1 with Nathan Peterman at quarterback. Week 2 they'll try rookie Josh Allen, which is probably best for the long-term success of the team, as he'll get some, er, experience, but it's going to be ugly. Vikings at Packers (-1): Aaron Rodgers makes people lose their minds. Yes, he's probably the best player in league, but (caps hands around mouth)... THE REST OF THE TEAM STINKS! Rodgers can't do it on his own, nor will he against a Vikings roster that is simply much better. Browns at Saints (-9): The Saints screwed over survivor pool players nationwide Week 1 when they got destroyed by Ryan Fitzpatrick. They're 9-point favorites once again Week 2, and I wouldn't touch this game with a 10-foot pole. Also, the Buccaneers and Browns at home the first two weeks? What an easy early-season schedule. Lions at 49ers (-6): I assume you all saw the Lions under Matt Patricia Monday night? That situation could become a disaster. Cardinals at Rams (-12.5): The Cardinals' quarterback is Sam Bradford. Patriots (-1) at Jaguars: I watched the Jags-Giants game on Sunday, and the Jags were thoroughly unimpressive on offense against a bad Giants defense. While that shouldn't come as a huge surprise, seeing as Jacksonville wins with their defense, they're still, you know, going to have to find ways to score. The Patriots are going to score, and I don't think the Jags can match them. Raiders at Broncos (-5.5): Welp. It only took one week for Jon Gruden to publicly call out his quarterback. I mean, he's probably not wrong. Derek Carr stinks, and looked totally uncomfortable in the pocket Monday night. Against the Rams, Carr got the ball out in 2.45 seconds, on average. By comparison, only one quarterback (Blaine Gabbert) got the ball out quicker during the 2017 season. Sometimes getting the ball out quickly can be attributed to dissecting defenses and making good, sharp decisions. In Carr's case, I just think his mental clock is in overdrive, hence him not letting routes develop and missing Cooper deep. Anyway, whether Carr has happy feet or his OL is bad, it won't get much easier against Von Miller and Denver's pass rush. Giants at Cowboys (-3): This is going to be a battle of one offense that has a few good linemen, a running back, and nothing else, verses an offense that has good skill players, but a terrible offensive line. If I'm picking which team looked less inept Week 1, I'll say... Giants? Seahawks at Bears (-3): One team is on the way up, and one is on the way down. • Picks against the spread: Ravens (+1), Redskins (-5.5), Eagles (-3), Vikings (+1), Patriots (-1.5).